©2007 Metrofashion.com- Poseidon would happily lap at the veiled and baubled runway maidens in Randolph Duke's Spring Summer 2008 Collection from Mercedes Benz Fashion Week Los Angeles. 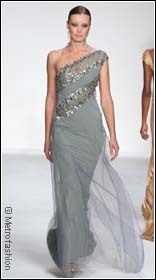 Duke called on a "heightened consciousness" of going green to honor Mother Earth with pearl-trimmed and fern-patterned evening dresses for Spring 2008 Special Occasion Couture. 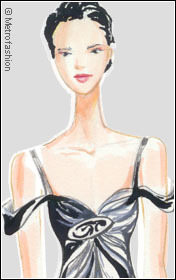 Lush gowns in silk taffeta, tulle, satin crepe, and foiled jersey adorned statuesque catwalk models where Duke emphasized the modern look of exposed shoulders and fitted waistlines. Natural stone colors like granite, and smoke were mixed with seaside-inspired motifs of palm and palmetto. Shimmering iridescent jewelry seem to radiate the sparkles of a brilliant spring beach day. Beyond a simple transformative message from consumerism to awareness, Randolph Duke's gentle breezy Spring 2008 Eveningwear Collection reminds us that the Earth itself provides the pallete and accents to create beautiful feminine expression. And that Poseidon is as much the diva's infatuation as she his muse. 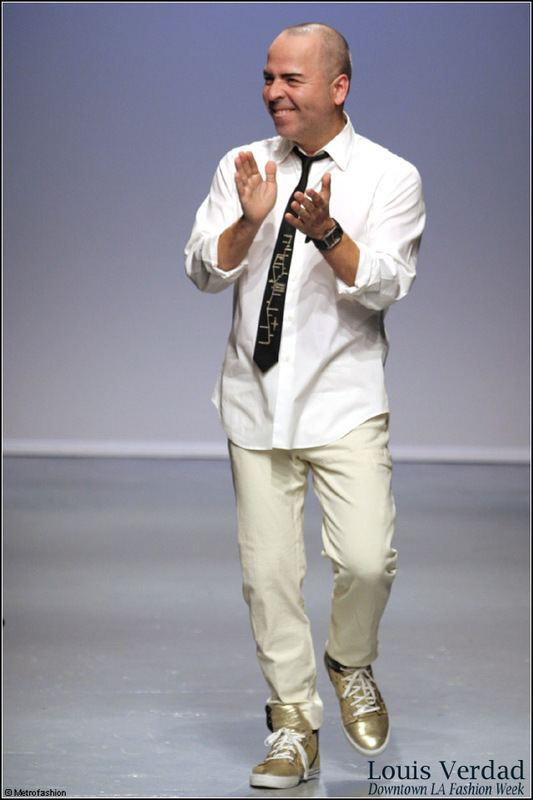 PHOTOS: ©2007 Metrofashion.com All Rights Reserved. Cover Above: Randolph Duke Spring Summer 2008 Couture Collection from Los Angeles at Smashbox Studios. Below Left to Right all Panels: Randolph Duke Spring 2008 Ivory Matte Jersey Blouson Gown with Seaside Motif, Veiled Silk Taffeta Gown in Palm Shade with Decorative Waist Belt, Randolph Duke Eveningwear Couture 2008 Abalone Trimmed Assymetric Gown in Agave Ocean Blue Shade with Veiled Skirt.